Gone are the days of wedding reception music consisting of nothing but the same tired crooners and cheesy party standards. Couples today are choosing wedding music that reflects their tastes whether they be traditional, more modern, or a mix of both. Wedding music need not be limited to the classic wedding songs. Some of the best wedding reception playlists not only reflect the couple but contain a good balance of styles that encourage the festivities and continued celebration. When working with a wedding DJ to plan wedding music, wedding planners and the couples should dedicate time to discussing not only the style of music they want at their reception but the specific songs they want to be played. Many wedding DJ companies have a comprehensive questionnaire for couples that can help the DJ to deliver exactly the experience the couples want. Others dedicate a meeting to answering those important questions. When hiring a DJ, it's best to walk the line between giving good direction and dictating the entire playlist from the first song to the last. 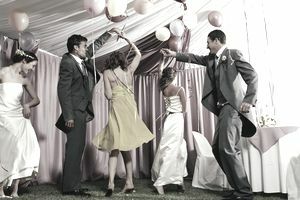 A good rule of thumb for planning wedding reception music is to work closely with the DJ so that they understand your style and preferences and providing a list of up to twenty songs that you definitely want to hear (some of which you might specifically earmark for those important dances like the first dance or the father-daughter dance). Any more than that and you risk wasting the DJ's talent and your money. If there are songs that you don't want to hear, list those as well. When you're building your must-have wedding must list or simply giving the DJ an idea of the style and feel you're going for you might consider having a private listening party. Whether it's for the cocktail reception, dinner hour, first dance or later in the reception, these songs will bring style to the modern wedding music playlist.